Just finishing a Sunday meal, the members of this well-to-do family may be getting ready to return to church. The mother hands a prayer book to the younger of the boys, and the little girl holds her freshly starched cap and fan. Quiringh Gerritsz. van Brekelenkam appears to have combined a family portrait and a genre scene with a moralizing message. Van Brekelenkam emphasized the moral message by placing a large, framed landscape in the background above the mantel. As the family displays domestic virtues, the painting within the painting shows a couple gazing at a ship at sea under a dark sky illuminated by a shaft of light. The painting within their home serves as a reminder to the family to look to the light as they continue on life's uncertain voyage. Alfassa, Paul. "Le Tri-centenaire de Rembrandt: Les expositions de Leyde et d'Amsterdam." Revue de l'art ancien et moderne 20, no. 114 (1906), p. 200. Bredius, A. Die Leidener Austellung von 1906 zur Erinnerung unde Feier des 300-jährigen Geburtstages Rembrandts (Haarlem: Van Meurs & Van Gogh, 1907), unpaginated, no. 15. Brière-Misme, Clotilde. "Un émule de Vermeer et de Pieter de Hooch, Cornelis de Man, I." Oud Holland 52 (1935), p. 23, fig. 11. World Collectors Annuary. 47 vols. (1946-97). (Amsterdam: Minerva Uitgevers Maatschappij, 1951), vol. 3, p. 336, no. 2630. Galerie Charpentier, Paris. Collection de feu M. Adolphe Schloss (deuxième vente): Tableaux anciens. December 5, 1951, unpaginated, lot 36, pl. 25. Valentiner, William R., and Paul Wescher. The J. Paul Getty Museum Guidebook (Los Angeles: J. Paul Getty Museum, 1954), p. 27, no. 11. Valentiner, William R., and Paul Wescher. The J. Paul Getty Museum Guidebook. 2nd ed. (Los Angeles: J. Paul Getty Museum, 1956), p. 22, no. 11. Fredericksen, Burton B. A Handbook of the Paintings in the J. Paul Getty Museum (Malibu: J. Paul Getty Museum, 1965), p. 18, no. G-89. Getty, J. Paul. The Joys of Collecting (New York: Hawthorn Books, Inc., 1965), pp. 30, 118, 121, ill.
Stechow, Wolfgang. Dutch Landscape Painting of the Seventeenth Century (Oxford: Phaidon, 1966), pp. 6, 189, fig. 4. Fredericksen, Burton B. Catalogue of the Paintings in the J. Paul Getty Museum (Malibu: J. Paul Getty Museum, 1972), p. 91, no. 121, ill.
Walford, Ewan John. Jacob van Ruisdael and the Perception of Landscape (New Haven and London: Yale University Press, 1991), p. 42, fig. 19. Westermann, Mariët. "'Costly and Curious, Full of Pleasure and Home Contentment': Making Home in the Dutch Republic." In Art & Home: Dutch Interiors in the Age of Rembrandt, exh. cat. (Denver: Denver Art Museum, with Waanders, 2001), pp. 32-33, 56, 58, 60, 62, fig. 38. Westermann, Mariët. Art & Home: Dutch Interiors in the Age of Rembrandt, exh. cat. (Denver: Denver Art Museum, with Waanders, 2001), pp. 194-95, no. 82, fig. 38. Stott, Annette. "The Dutch Dining Room in Turn-of-the-Century America." Winterthur Portfolio 37, no. 4 (2004), pp. 223-24, fig. 3. Krohn, Deborah, and Peter N. Miller, eds. Dutch New York between East and West: The World of Margrieta van Varick, exh. cat. (New York: Bard Graduate Center and The New-York Historical Society with Yale University Press, 2009), pp. 254-56, no. 109, ill.
Andersen, Alan, and David A. Schorsch. "A Rare William and Mary Cabinet: Some Thoughts on Its Function and Origin." In Expressions of Innocence and Eloquence: Selections from the Jane Katcher Collection of Americana. Jane Katcher, David A. Schorsch, and Ruth Wolfe, eds. (Seattle: Marquand Books, 2011), vol. 2, p. 236, fig. 15.5. Loughman, John. "Domestic Bliss? 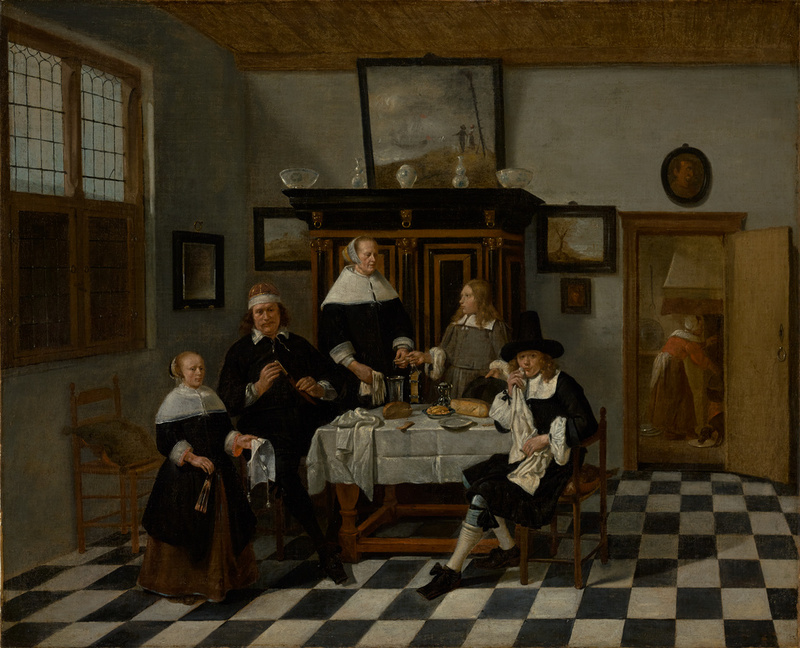 Images of the Family and Home in Seventeenth-Century Dutch Genre Art." In Images of Familial Intimacy in Eastern and Western Art. Nakamura Toshiharu, ed. (Leiden: Brill, 2014), pp. 87-88, fig. 3.6. Toshiharu, Nakamura, ed. Images of Familial Intimacy in Eastern and Western Art (Leiden: Brill, 2014), p. xiii, fig. 3.6.